Sartre's friend and sometime rival, Paul Nizan was a prototype of the angry young man. Ideologically a Marxist, politically a Communist, professionally a writer, endowed―Sartre conceded―with a sharper mind and greater literary ability than his own, Nizan diagnosed the ills of French society in the 1930's. His writings, vilified by the Party he left in September 1939, are being rediscovered in France. W. D. Redfern gives now the first full-length appraisal in English of his life and work. 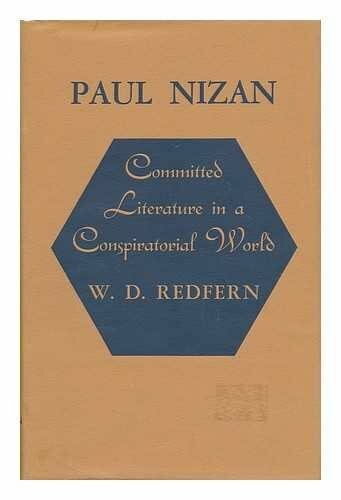 Nizan as a writer and a critical intelligence is seen in Mr. Redfern's analysis of his radical imagination and its deployment in his novels, polemical essays, journalism, and correspondence. His place among his contemporaries is also assessed, Mr. Redfern thus illuminating the political and literary worlds of the philosophical rebels (Berl, Politzer, Friedmann), the Communists and idealists (Aragon, Malraux, Weil) in Paris during the 1920"s and 1930's.